Practice Engineering Drawing questions and answers for interviews, campus placements, online tests, aptitude tests, quizzes and competitive exams. This set of Engineering Drawing MCQs focuses on “Projection of Solids with Axis Inclined to Horizontal Plane and Parallel to Vertical Plane”. 1. When a solid is placed such that axis is inclined with the H.P and parallel to the V.P. Its projections are drawn in __________ stages. Explanation: In the initial stage, the axis is kept perpendicular to the H.P and parallel to V.P and projections are drawn and then turning the axis to given angle of rotation with H.P and then again projections are based on previous vertices and edges. 2. A hexagonal pyramid first placed in such a way its axis is perpendicular to V.P and one edge AB parallel to H.P and then next this is turned about its axis so the base AB is now making some angle with H.P. The top view for previous and later one will be having different shapes. Explanation: For given positions of solid the solid is just rotated around itself and given the axis is perpendicular to V.P so the top view gives the true shape and size of its base but the base is just rotated to its given angle shape will not change. Explanation: For given positions of solid the solid is just tilted to some angle with H.P and previously given the axis is perpendicular to H.P so the top view gives the triangle and next with some given angle shape will change to irregular shape of circle and triangle. 4. A regular cone first placed in such a way its axis is perpendicular to H.P and next this is tilted such that its base is making some acute angle with H.P. The front view for previous and later one will be having same shape. Explanation: For given positions of solid the solid is just tilted to some angle with H.P and previously given the axis is perpendicular to H.P so the front view gives the triangle and next with some given angle shape will not change but just rotate. Explanation: For given positions of solid the solid is made acute angle with H.P and previously given the axis is perpendicular to H.P so the front view gives the rectangle and next with some given angle shape will rotate totally. Explanation: For given positions of solid the solid is made acute angle with H.P and previously given the axis is perpendicular to H.P so the front view gives the circle and next with some given angle shape will change to rectangle with circular ends. Explanation: For given positions of solid the solid is made acute angle with V.P and previously given the axis is perpendicular to V.P so the top view gives the rectangle and next with some given angle shape will not change but just tilt to given angle. Explanation: Given a triangular pyramid which means the projection to its base gives triangle of base and other orthographic views give triangle due to slanting sides. Here given is pyramid whose axis is perpendicular to H.P so its front view will be triangle due to sides and top view will be triangle of base. Explanation: Given a square pyramid which means the projection to its base gives square shape and other orthographic views give triangle. Here given is pyramid whose axis is inclined to H.P so its front view will be isosceles triangle and top view will be square. Explanation: Given a square prism which means the projection to its base gives square shape and other orthographic views give rectangle. Here given is prism whose axis is inclined to H.P so its front view will be rectangle and top view will be irregular polygon. Explanation: Given a regular cone which means the projection to its base gives circle shape and other orthographic views give triangle. But here given is inclination it may give irregular shape in its top view if the angle give is acute but given angle is 90 degrees so it gives perfect shapes. Explanation: Given a regular cone which means the projection to its base gives circle shape and other orthographic views give triangle. But here given is inclination of 90 degrees so previous ones will be circle and later one will be triangle. Explanation: As normal a tetrahedron gives equilateral triangle for a project to its base and isosceles triangle for other view when placed without inclination but here inclination is given but given view is top view so the shape will change to isosceles triangle. 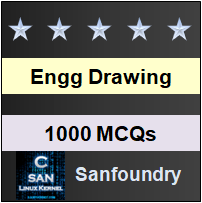 Sanfoundry Global Education & Learning Series – Engineering Drawing. To practice MCQs on all areas of Engineering Drawing, here is complete set of 1000+ Multiple Choice Questions and Answers.